← Facts & Figs | On poverty alleviation ~ because they speak louder than words. Already at the forefront of “urban green movement”, Portland, Oregon boasts among the nation’s highest per capita usage of bicycles, and the city continues to forge ahead with innovative thinking on how to reduce carbon footprint and further boost its green quotient. Here’s one such direction involving green buildings, as appeared in technocult. The federal government plans to plant its own bold garden directly above a downtown plaza. 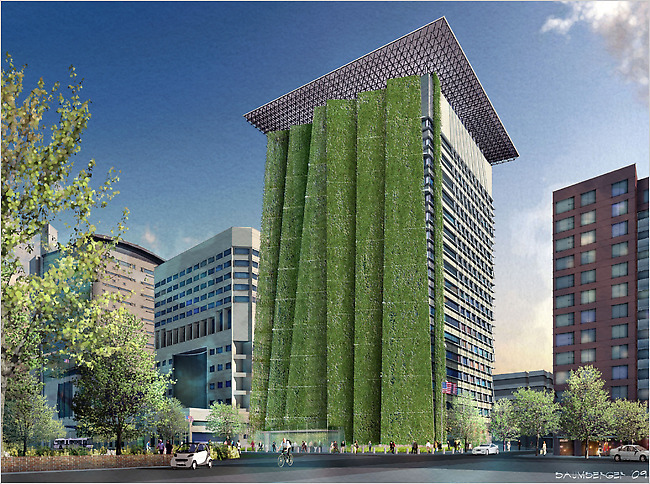 As part of a $133 million renovation, the General Services Administration is planning to cultivate “vegetated fins” that will grow more than 200 feet high on the western facade of the main federal building here, a vertical garden that changes with the seasons and nurtures plants that yield energy savings. This entry was posted in Green Building, Sustainable Development and tagged Sustainability, Urban Matters. Bookmark the permalink.